With internet connections getting faster over time, more and more people are able to upload and share larger files over the internet. While for many it used to be slow to send a few Megabytes, it’s now quite possible to upload hundreds of times that in a matter of minutes. There are many places you can upload files to, including cyberlocker file hosting services, cloud hosting or even more advanced methods like FTP. Many file hosting and sharing services have free and subscription based options. Quite often the free service files are automatically deleted after a period of weeks or months, or after a period of inactivity. But if you want to do the opposite and make your files expire after a certain time or after a specific number of people have downloaded them, those options are not available everywhere and the choices are a bit more limited. Some of the more well known file sharing services like DropBox offer expiring links but the feature is only available to paid subscribers. If you just want to upload some files and have them expire after a certain amount of time or number of downloads, there are some options available. Here are 10 services for you to look at. If you want to do a similar thing with emails and messages, we have written about that before in Online Services to Send Messages that Auto Delete after Reading. 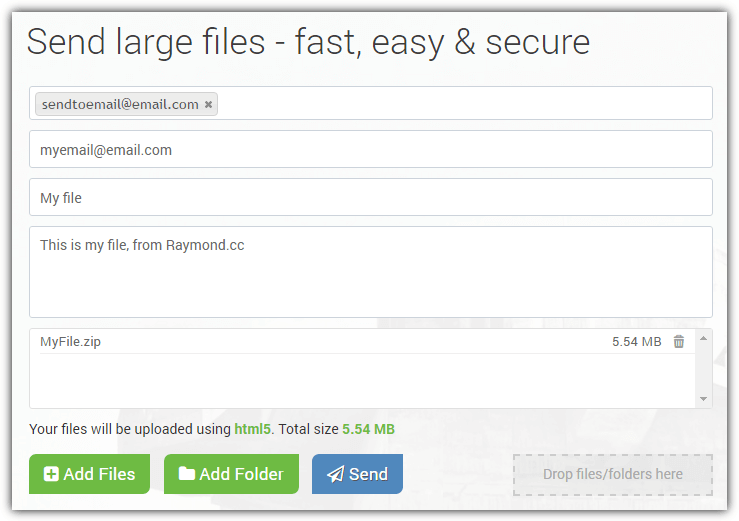 Filemail has one of the most generous file size limits for uploading. The free version is currently set at 30GB for each file. You can either send the file link direct to other email recipients or simply get the link to the uploaded file and distribute it as you want. 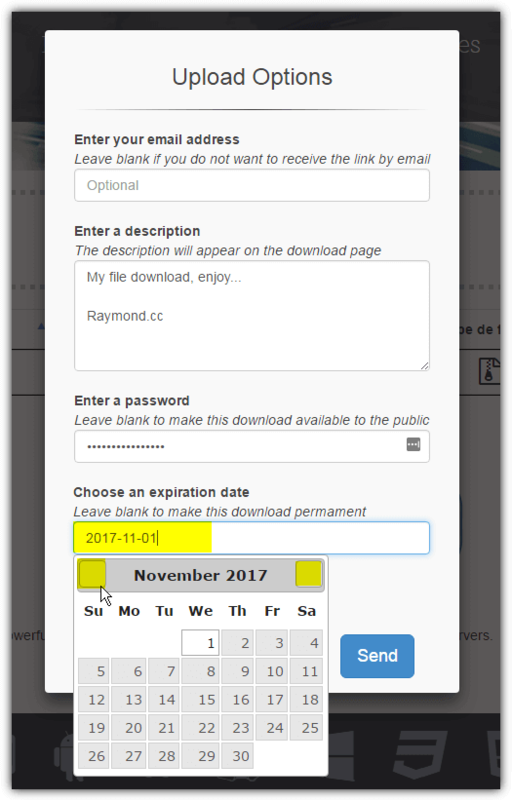 Filemail has an expiration time of 1 to 7 days. There is a fair use limit on uploads and you will have to wait 24 hours after uploading a few files to use the service again. Clearing Filemail cookies in your browser should remove the limit. Enter a recipient’s email with optional subject and message, then enter your own email to receive messages about what has been downloaded and when. If you just want a link, simply skip those steps and drop the file onto the box or press the button to upload a file or folder, then press Send to set the expiry limit and upload the file. 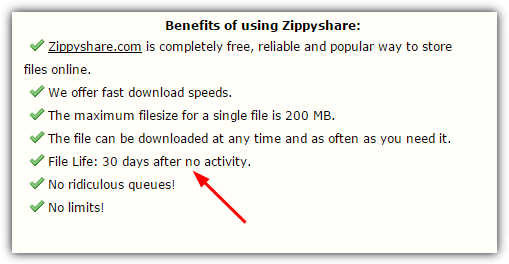 The download page is interesting because it offers additional options to download multiple files in a Zip archive, via torrent or even through FTP. Wikisend is a simple service that has a maximum upload limit of 100MB per file. The file can be given an expiry time of anywhere between 1 and 90 days. However, after 7 days, the file will be given a low priority and download speeds will be half of those files under a week old. Downloads can be protected with a password for that little extra bit of security. Manually browse to a file by clicking Choose File and click Properties to expand the options. Supply an optional friendly name, description, password and enter the expiry time which defaults to 7 days. Enter your own email to send the link information to your inbox. The download link will become available in the download tab, there’s also an ID number so you can go straight to the Download tab and enter it to access the file link. Creating a free account allows you to edit the file properties without reuploading the file. Both of these services are from the same company, RCPmedia. We’re not quite sure why ExpireBox exists because the two are almost the same. However, FileNurse allows uploads of up to 300MB per file which can be held for up to 7 days. ExpireBox, on the other hand, allows up to 150MB and 2 days. FileNurse also offers shortened URL download links and a more secure HTTPS website. Drop a file onto the window or click “Select file” and browse for any type of file. Then after uploading has finished you’ll be shown the file ready window. From here, you get to enter a file description, the download link, the file delete link, the option to generate a random password for the file, delete the upload in 0-7 days, delete the file after 1-100 downloads, and send the link via email. The option buttons to the right are where you get link QR codes, short URLs and links to share the file on social media. The tmpfiles service is the smallest here in terms of the maximum expiration date for files. The default is 60 minutes although that time can be increased manually to 120 minutes. There’s also a number of downloads limit which defaults to unlimited. It doesn’t say what the maximum manual limit is for this on the page but we found out it is up to 1000 downloads. Click the Choose file button to browse for a file, optionally set the download limit, set your time limit and press the Upload button. There is no on page progress meter so you will have to look in your browser status bar for how the upload is going. 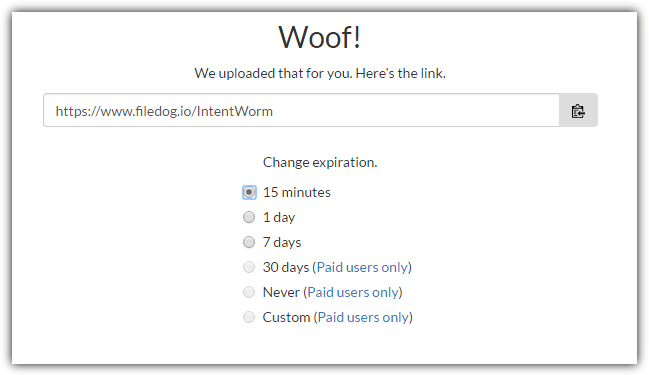 Finally, a page with a download button will appear with the expiration time. Give the URL in the browser address bar to others so they can get to the download link. Maximum file size is 100MB. MediaFire is one of the oldest file hosting sites around. Other long running cyberlockers like RapidShare died off while MediaFire moved more towards cloud storage and is still around. These days you get 10GB of free storage on signup which can be increased to 50GB by referring friends and connecting/posting on social media. The maximum file size is 20GB. 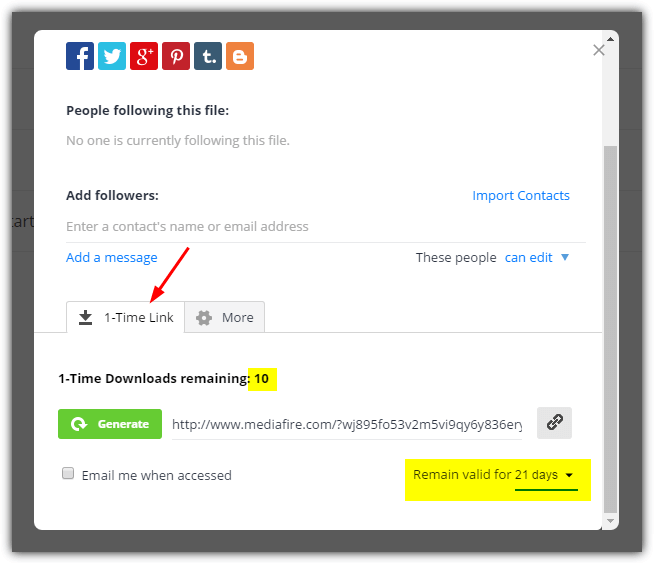 Although MediaFire can create download and time limited links, it only does both at once. The time can be set to expire from 1 up to 30 days but the download limit for the file is locked at 10. To access the option select a file and click Share, then press More sharing options in the bottom left of the sharing window. Click the 1-Time-Link tab and press the Generate button. Finally, select the time limit from the drop down and copy the generated link. This is a nice and simple service with file limits of up to 100MB per file although it’s worth noting NullUpload is still in alpha stage. A file can be made to expire after 1, 7, 15, 30 or 90 days. There’s also the option to randomize the filename and protect the download with a password. Executable files (.exe) are not supported for upload but just about everything else is. NullUpload doesn’t have a drop target to upload so you have to press the Select file button and browse for a file manually. Then check the optional boxes for a randomized filename and password protection, and finally choose the expiration time from the drop down. After the upload is complete, you’ll be given a link to the file with and without the password, along with the password itself (which is random) and a delete link if you want to remove the file early. File.Town is another easy service to use. You don’t need to register to upload or keep track of downloads and the file size limit is 100MB. Any type of file can be uploaded and there are no logs stored and no limits on the number of uploads or downloads. Simply drop a file onto the town image or locate one manually by clicking on the image. Enter the number of days to expire the file or leave it blank to keep the file forever, then optionally enter a downloads limit. Finally, choose a password if you want one and press Upload to send the file. 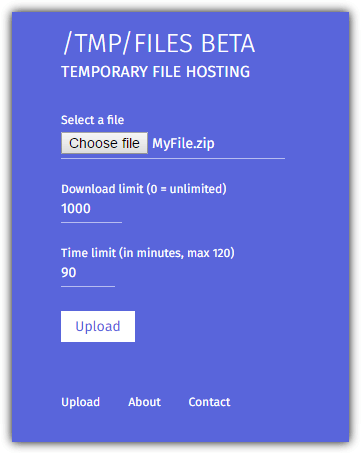 Once the upload is complete, you will be given the file link, an alternative short URL and a stats URL where you can get information like the number of downloads and password attempts. This is a very generous service with no limit to the number of uploads, a maximum size of 10GB per file and up to 100 simultaneous uploads. Although you can’t restrict the number of downloads, the good thing about the timed link expiration in Gofile is the files don’t expire on their own. Therefore, you can set an expiry date to whenever you like in the future, even months or years ahead. Drop a file onto the marked area in the window or manually locate one with the Add file button, then press the Send button. Optionally enter your email to receive the link, enter an optional description, and an optional password. Clicking in the expiration date box pops up a calendar so you can select the date when the file expires. There are hidden buttons either side of the month display to cycle through or you can manually enter a date with the format yyyy-mm-dd. Finally, choose whether to allow comments and press Send to upload and receive the download link and removal code. While FileDog is a nice and easy service to use, what sizes and limits you have to play with are not made entirely clear. The main web page says file size limits are both 20MB and 500MB for free users. It also tells you there are unlimited downloads and then when you register you are given 5GB of space. As it costs nothing to try FileDog out, you can see if it works for you without risk. The expiration for free files is either 15 minutes, 1 day or 7 days, after which your files are permanently deleted. Just drop a file onto the box or click to browse for a file, it will be uploaded immediately. You will then be able to set the time limit and be given the download link to copy and give to others. 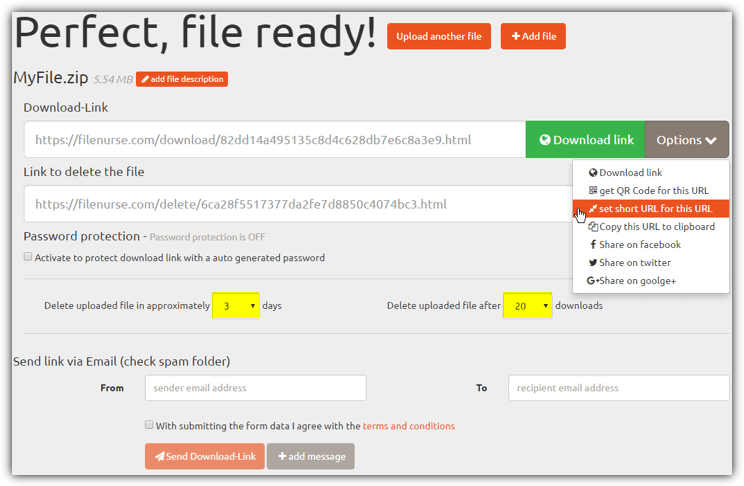 A free account allows you to track several files at once for expiring dates and number of downloads. On the face of it, UploadFiles is quite a generous service with a 5GB maximum file size, 5GB storage space, unlimited uploads, unlimited downloads, and download tracking/usage by signing up for a free account. Unfortunately, the major drawback is the free account download speed is limited to 500KB/s per file. Even though the size and space limitations are pretty good, you probably won’t make much use of them because of the slow download speed. Drop a file onto the box or locate the file manually and it will immediately start to upload. Once finished, you will be shown the download link for the file and can select from 1 hour, 1 day, 7 days or 30 days for the expiration time. After 30 days the file will automatically be deleted from the service. Creating an account will let you add a password to downloads, create short links, share files to social media, and see the expiration date/number of downloads per file. Postimage.org is another big one, but it’s gotten jammed with racy ads around the images. Just signed up for wikisend, it was fast and simple. I tried to use the Amazon S3 but it was a little too complex and costly. Thanks for the post! 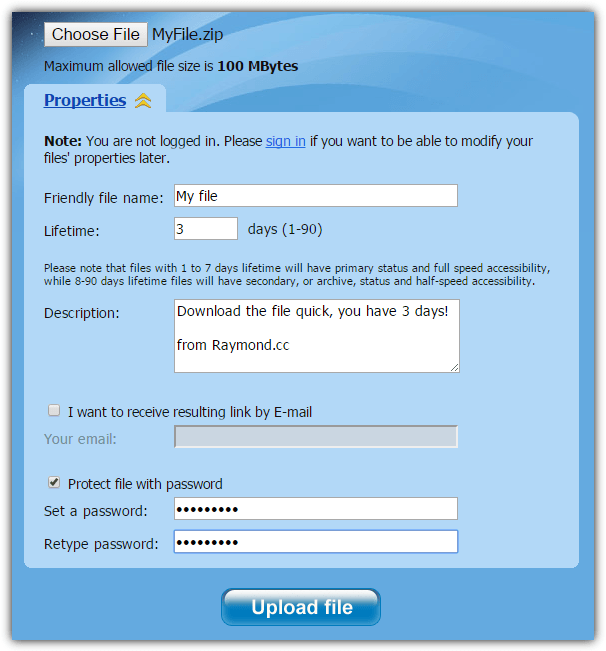 Really great information about FREE File Hosting with Expiring Links. I like your blog a lot. Thanks for sharing us this wonderful information.